Tannehill kicks Ballage out of huddle. Post subject: Tannehill kicks Ballage out of huddle. Post subject: Re: Tannehill kicks Ballage out of huddle. Good for rt. I remember Marino grabbing face masks back in the day. Absolutely! It's his team, he needs to take control. Someone created this meme for The Phinsider. Sorry, not impressed. Where has that been the last 7 years? Did he grow a pair during rehab??? Do it to underachiever Davonte Parker. To Juwan James. But to a rook?? A fourth rounder who must be scared to death about his livelihood just putting on that helmet everyday?? And then there's Gase. What an a** kisser. Endorsing it because clearly he's shown HE doesn't have the cojones to call out any of his players, and had to hire a bunch of veterans on their last legs to bring discipline. This team/franchise has proven to be Super Bowl caliber in all the off-the-field soap opera categories: Incognito, Timmons, Ajayi, Landry, Cutler, Foerster. Just win the darn games, earn respect and your ridiculous salaries by DOING it, not TALKING it and leave all this peripheral BS in the locker room. I don't agree with your assessment of the coach. He has fired people who were not living up to his expectations so there is that. Different styles can be used in coaching. I too have voiced my concerns about his coaching but I don't agree with your descriptions of his personality. 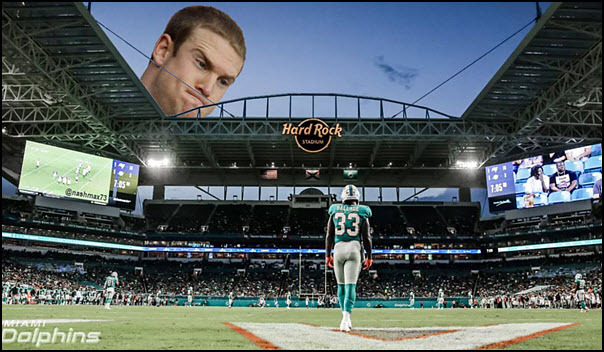 I think Tannehill is trying to learn how to be a leader. Small steps. Just to be clear I would like Tannehill to be replaced by a better QB but not just any QB especially not a worse one. I don't know about his personality but there's some evidence so far that he isn't the greatest at inspiring his players or discipling them for that matter. And I agree with you about not replacing Tannehill just for the heck of it, but I'm just sick and tired of all this sideline stuff, how it's celebrated both in the media and by fans as if it means anything, especially this one instant, where the target was some lowly rookie 4th rounder. I feel for the kid. First he was lambasted in all circles for his fumble, totally excusable in an August game where the kid is trying to win a job showing the heart and hustle this team needs in quadruple. And Tannehill may be trying to act out the part of a QB leader but you can't change your stripes in that regard. You either have it or you don't. Pulling that stunt in August doesn't prove anything. Gotta disagree with you there. You CAN in fact grow as a leader. Every great QB ever has done so. Heck, every great leader has done so. It's nothing to fault RT for. He may never be a top 5 QB, but he's still progressing and pushing to improve, so give him credit for that. the quality of leader is in you, you can try to act it out but it will not last....if you have to think about it it's not going to work....I don't know what examples you may use of QBs that developed it but the successful ones, the ones that were respected because their manner was sincere and consistent, they had it in them from the beginning. It was in their personality and achieving success made it even more significant. For Tannehill, seven years in, with little success and nothing but questions, with several cases of players doubting him publicly, I don't see it as a any kind of factor. Charisma is natural leadership can be learned imo. Leadership is easier if you have charisma. I honestly think this is getting quite overblown. Ballage has flashed a lot but has a made a lot of mental mistakes according to those observing practices. He also has effort questions. Sounds to me like Tannehill just erupted out of pent up frustration with the guy. There were also 4 scuffles at practice yesterday, one which got Gabe Wright cut. Its okay for guys to have an off day and lash out. If it becomes a habit then sure, time to address the situation. You can grow into being a leader, but I'm not sure Tannehill is that guy. He'll lead be making guys line up correctly and know the offense, but he isn't going to inspire them with elite play.